Forever Manchester is delighted to be one of the 3 headline charities that will benefit from money raised at the 2018 Tour De Manc taking place on Sunday 6th May 2018. The Tour de Manc® includes both a 100 mile (Full Manc) and a 100 KM route (Half Manc) cycle challenge. For full details of each ride together with further information about the Tour de Manc, please scroll down the page. If you wish to ride for round ‘ere and raise money for Forever Manchester to support community activity right across Greater Manchester then follow the instructions below to sign up. But before you sign up please make sure you familiarise yourself with the Rides and select the one most appropriate to your experience and ability. 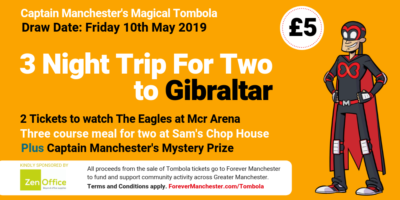 Tour de Manc® is offering riders, wishing to raise money for Forever Manchester, a discounted registration fee – £10 off the prices stated above. By riding for Forever Manchester you’ll pledge to raise a minimum of £100 for Forever Manchester. Click on that big Green Button below, where you will be redirected to the Tour De Manc sign up page. Click on the Login button, where a new page will open. Select the number of people you are registering for in the drop down box. 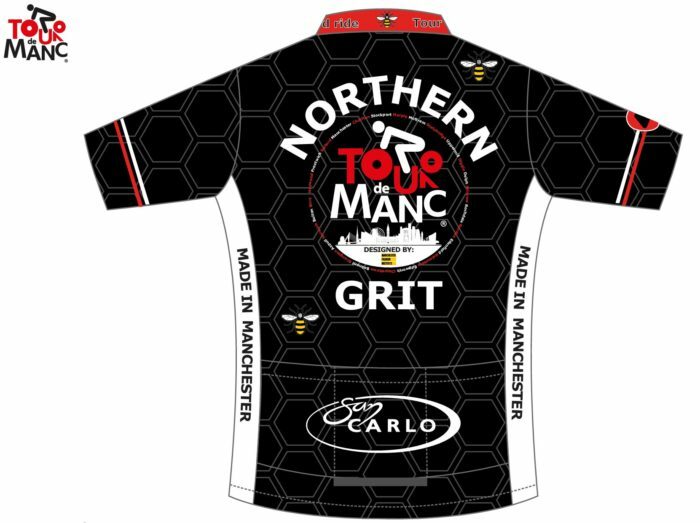 You will then be asked if you want to buy a Tour De Manc cycle jersey (see below) at a cost of £49.99. Click continue, and enter your billing information, click submit and go to checkout to make your payment. Once you have completed the booking form, all you need to do is to set up your Just Giving page – Head to our handy guide for tips on how to create and maintain your page. 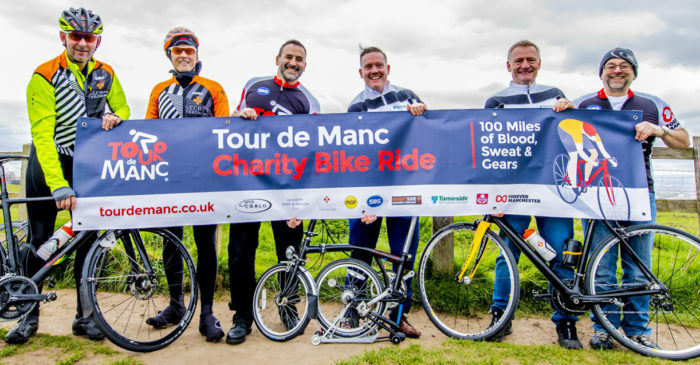 Tour de Manc® is now in its third year and was founded by Danny Franks who came up with the idea of a charitable “tough” sportive through all 10 Greater Manchester boroughs. As a long standing Forever Manchester supporter and Ambassador, Danny rode a solo 80 mile Tour de Manc route in July 2015 raising over £800 for Forever Manchester. In 2016 Danny joined forces with old school friend Tony Rubins and created the #allforcharity non-profit Tour de Manc Ltd. Together, Danny and Tony developed the idea of Tour de Manc®, a ‘not for profit brand’, which aims to raise significant funds for registered charities, as well as supporting cycling inclusivity (enabling para-cyclists, women cyclists, kids etc) and encouraging people to cycle for health benefits. Tour de Manc® enables fundraising through cycling related events and accompanying programmes, such as fitness and skills programmes to get riders fit for the Tour de Manc® cycling challenges. In 2016 and 2017, Tour de Manc® held two distance rides 100 mile “Full Manc” and 100km “Half Manc”. The sportive raised several thousands of pounds for Forever Manchester and Haematology & Transplant Support (HaTS). An epic challenge and is not for the unprepared or faint hearted. The Full Manc is just over 103 miles long, tours all 10 boroughs of Greater Manchester in an anti-clockwise direction and has around 8700 ft. of climbing to test yourselves on. There are a number of closed road sections including the King/Queen of the mountain prize section, which tackles the lung-busting Werneth Low. The route heads out on a flat, mainly downhill route, past Heaton Park, towards Agecroft, through Salford, past Old Trafford and Chorlton to Stockport. Then the course gently rises through Stockport to Marple and starts climbing at Marple Bridge. After a “warm up” climb, you enter a closed road KoM/QoM section which tackles the short, but steep Werneth low climb, affording you a sensational view of Manchester and a panorama of the hills to the North East and the North – enjoy that view! After a quick “light” refreshment stop, you head through Tameside and climb over towards Saddleworth, passing through Uppermill before a long steady climb to the second feed station. Here you can enjoy Colin’s hospitality and his amazing scones whilst taking in another great view. Heading over some testy climbs, you will make your way over to Newhey, Milnrow and through Rochdale before a third stop with hot food and a chance to prepare yourself for the harder half of the ride. First you climb Owd Betts, then up to Holcombe before a VERY tough climbing route and closed road section to Belmont where you will enjoy your last feed station. You will need to replenish your reserves here as you have Rivington, Chorley Old Road and a handful of climbs towards Bury. Then just to add that little sting to the tail, you have the Heap Bridge climb which takes you to a few miles from the finish. This is a tough challenge for the fit occasional rider. This route is not a flat precession, but an achievable challenge, which you will enjoy. The Half Manc is 62 miles / 100km long and shares the first half of the Full Manc Route. It takes an anti-clockwise circuit of Greater Manchester and has around 4500 ft of climbing to tackle. There are a number of closed road sections including the King/Queen of the mountain prize section, which tackles the lung-busting Werneth Low. After a quick “light” refreshment stop, you head towards Tameside and climb over towards Saddleworth, passing through Uppermill before a long steady climb to the second feed station. Here you can enjoy Colin’s hospitality and his amazing scones whilst taking in that view. Heading over some testy climbs, you will make your way over to Newhey, Milnrow and past Rochdale before a third stop with hot food and a chance to prepare yourself for the last real climb up Owd Betts. You will take a left at the split point (51 miles in) and climb a little further to the windmill (where there are some magnificent views to enjoy) before you have a long, picturesque descent through the Ashworth Valley to Heywood. From there it’s just a few miles back to the finish.